From my collection of Sankey diagrams here are three very similar samples depicting energy flows in a building. All three are from Germany (did I mention that more than half of the Sankey diagrams seem to be from Germany or Austria?). These are all very simple Sankey diagrams. This first one is a hand-drawn goodie from the times when reports were still done with a typewriter. It shows use of fuel oil (‘Heizol’) in a school building, and interesting to see, the flows are given in kilograms fuel oil rather than to represent the heating value. 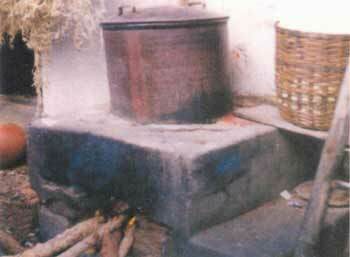 The school building consumes 80 tonnes of fuel oil per year. The next building energy flow Sankey diagram shows flows in Watts (W). Not sure where I found this one. Flows again are not proportional (spot the 470 W flow and compare it to the others). Main inputs are radiation (‘Strahlung’) and electric energy. 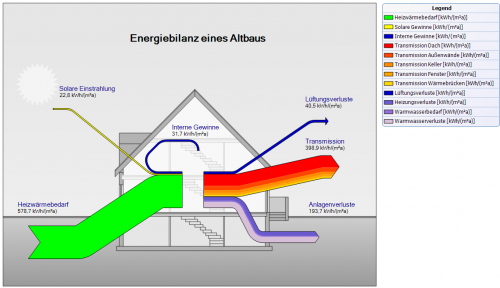 A heat pump cycling energy can be seen, so it seems that this one is maybe for a passive house. This last one done with a Sankey diagram software hence flows are to scale in this one (although I have some doubts regarding the width of the fuel oil input arrow on the left). Flows are in kWh per year. 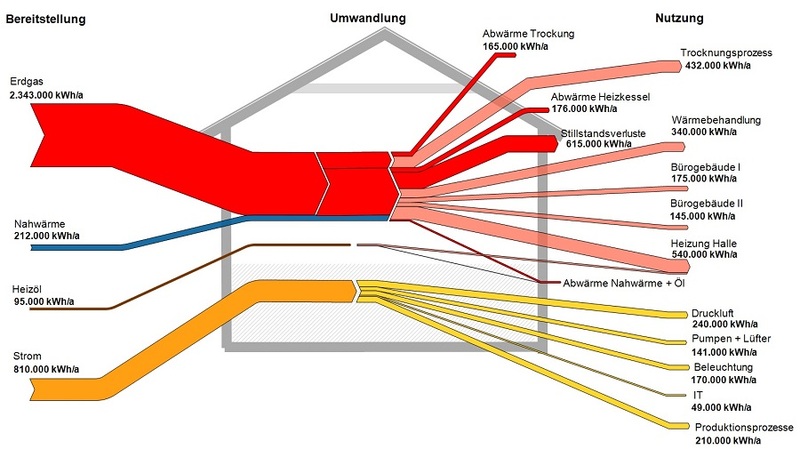 Main fuel type is natural gas (red), some district heating (blue). Electric energy in yellow, consumed by IT, lighting, air compressors, and so on. 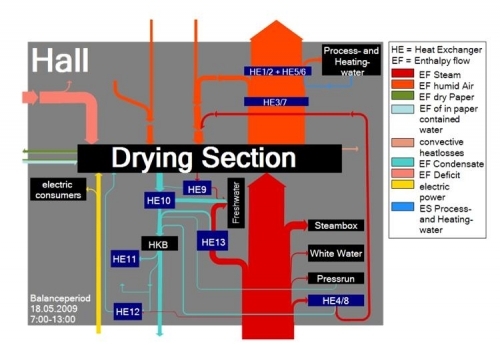 This energy flow Sankey diagram is probably for a factory building or complex. I will try to add the sources where I found these three diagrams. Please forgive my negligence this time. Here is another one … enjoy! Same topic as in my previous post, heat flows and losses, this time in a continous furnace. Recovered heat loop is strange: arrows gets wider in the curves, as if painted by hand. Funny serpent arrow for opening (radiation) losses. No values given. All arrows have the same colour. Source: Article ‘Quest for Fire – Combustion Basics’ by by Daniel H. Herring. 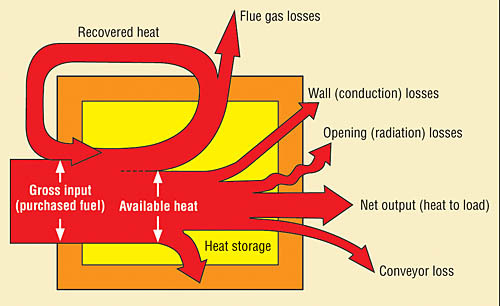 Published October 2, 2009 on Industrial Heating. The International Journal of Thermal Technology. Found this Sankey-like diagram accompanying an abstract submitted for the 2001 International Conference on Thermal Engineering and Thermogrammetry. Posting it here on the blog before this site eventually vanishes. This Sankey diagram is a good example of how not to draw Sankey diagrams, I think. Or, as a Japanese friend would put it politely: “Maybe… [turn head at 30° degree angle, make slight air-sucking noise by inhaling through open mouth] … maybe not so good”. The idea was to display heat losses at a slab furnace in a Turkish steel plant. 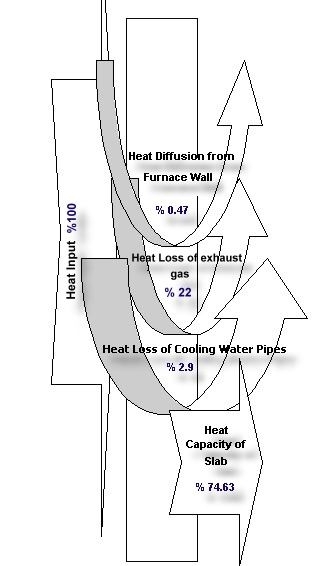 Heat losses were identified in exhaust gases (22 %), at the cooling pipes (2.90 %), and at the furnace walls (0.47 %). The fact that the widths of the arrows displaying the heat losses were chosen arbitrarily give a completely wrong idea of the proportions. The powerpointish curved arrows don’t really contribute to a better understanding. All in all, not a very good one. Adding this to my “Lying with Sankey diagrams” mini series (see part 1, part 2), which has been neglected recently. Diagramas de Sankey? Si Se Puede! The Mexican National Commission on Energy Saving (Comisión Nacional para el Ahorro de Energía (CONAE) present several success stories (casos exitosos) on their website. One success story dates back to 1997, and describes how an energy efficiency study of fired heaters (i.e. boilers) was carried out in a Nafta producing facility in the Veracruz state of Mexico. As a result of the study, several suggestions for optimization were implemented. Fuel consumption could be reduced by 23-24 %, while the efficiency of the ovens could be raised by 13% (calentador BA-2001 B) and 16% respectively (calentador BA-2001 A). Para los hispanoparlantes: el título oficial del proyecto fue “estudio técnico económico e ingeniería conceptual realizada a los calentadores a fuego directo BA-2001 A/B de la planta hidrodesulfuradora de naftas, del C.P.Q. “La Cangrejera”, ubicado en Coatzacoalcos, Veracruz” (otro candidato para el concurso mundial de titulos largos). The heat losses are shown as Sankey diagrams. The first describes the optimal situation, with an energy efficiency of 82,4 % “as guaranteed” by the maker of the fired heater. The arrows branching off at the top show the heat losses. 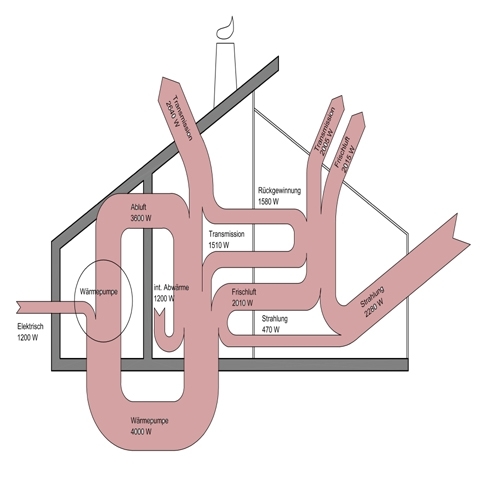 I like the fancy icons that show how energy is lost through the walls, because of deteriorated or insufficient insulation, and heat energy in the effluent gases. 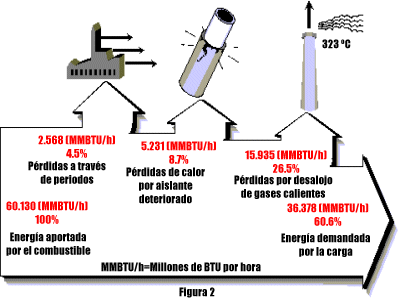 The flows are given in MMBTU/h (millions of BTU per hour).